Our regular bus service is organised every Saturday from, and to, Bristol, Exeter or London Heathrow airports and London St. Pancras Train station. Private car transfers can be booked on request and there are coach services available for groups arriving and departing together. Airport or port of departure and arrival. This information is required at the time of booking, or soon after, so that we can produce the final invoice, plan and arrange transportation, escorts, send instructions to host families, etc. Please note that some of the flights are early in the morning, i.e. one of the Malaga flights is at 7am which would mean leaving Ilfracombe at 3.30am, and consequently your client will need to book a B&B or hotel near Exeter Airport for the night before. Exeter airport is the closest airport to North Devon. It takes anywhere between 70 to 90 minutes from door to door to reach families. It is a small airport which means that the service and turnaround are very fast. Bristol airport is about 2 hours from North Devon. Different airlines operate from this airport to different countries. Please visit http://www.bristolairport.co.uk/where-can-i-fly for more information. It is a small airport which means that service and turnaround are very fast. 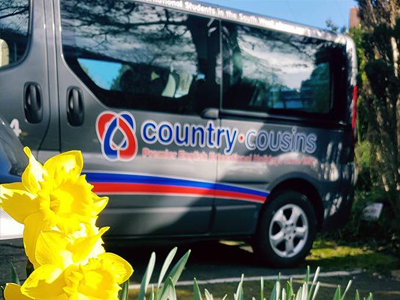 Country Cousins offers a comprehensive travel service from and to London Heathrow Airport (all terminals). On Saturdays, the bus to London Heathrow will always leave North Devon at 06:00 hours, dropping off at Heathrow Airport at around 11:30, and then departing at 15:00 hours for the return back to North Devon. Flights must arrive at Heathrow Airport between 11:00 – 14:00. Flights must depart between 14:00 – 17:00. Airport check-in time is 2 hours; we also allow 1 hour for traffic delays, so coaches arrive at Heathrow at around 11:00. 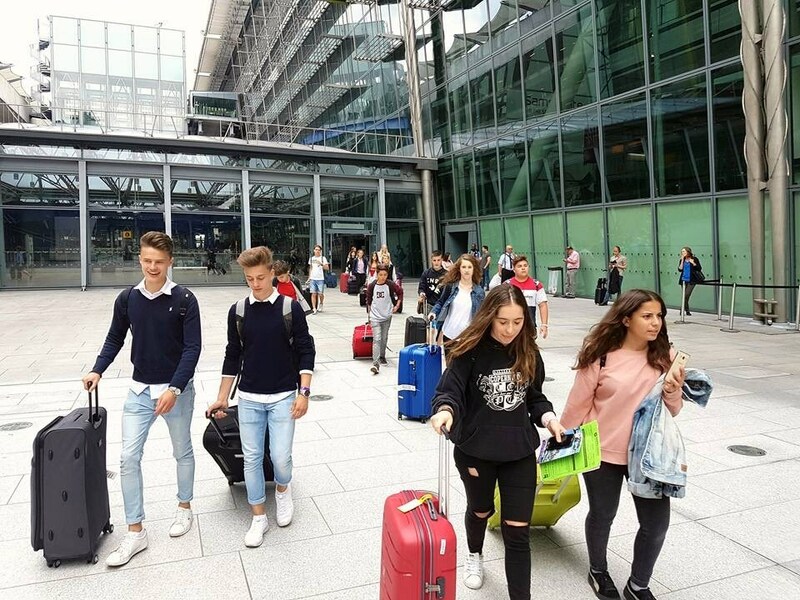 Please prepare your students for a long wait if only late afternoon flights can be booked and be aware that flights departing after 14:00 hours attract at £20 per hour waiting charge. Please make sure trains to St. Pancras arrive between 13:30 and 14:30 hours, and depart between 15:00 and 16:30 hours. All drivers are fully qualified, professional and well-mannered and have to complete periodic CPC training in order to keep their licence up to date. To safeguard passengers and the general public our driving staff must adhere to strict regulations on driving hours and breaks. 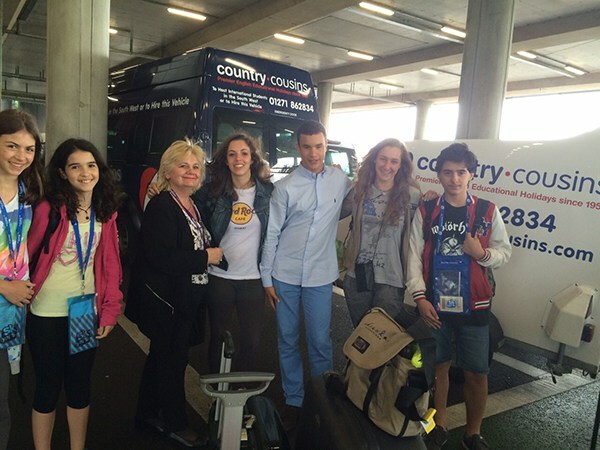 They are experienced in what they do and can always lend a hand where needed such as checking in students at the smaller airports, luggage handling and providing students with information. We have our own fleet of vehicles which range from cars, 8 seaters, 16 seaters to a 57 seat coach. All vehicles travelling long distance will offer comfort and air conditioning for those hot summer months. Country Cousins vehicles are maintained to the highest standard and undergo rigorous safety checks on a regular basis.